The DataCal Russian language keyboard labels, also known as keytop stickers, are a high-quality and economical solution to creating a Russian bilingual keyboard. DataCal labels are manufactured using durable Lexan® polycarbonate and 3M® adhesive, and are printed sub-surface to provide years of use. Easy to apply, with instructions for setting up your computer in Russian. Hundreds of languages available. The student labels are used primarily in older versions of windows but are not compatible with Windows XP, Vista or Windows 7. The regular Russian keyboard labels are compatible with Windows XP, Vista and Windows 7. Our three colors all show well on light colored keyboards, but only green will show well on black keyboards. The Russian (Student/Standard)keyboard labels are printed on clear Lexan® so the original key legend showsthrough; this allows you to add Russian labels to your existing keyboard so thatit becomes a bilingual keyboard (Russian and the original language of yourkeyboard). The labels are available on clear labels with blue , white, red orgreen Russian letters. This label set allows you to create a Russian Student orRussian Standard keyboard layout; this label set does not support the Windows Vista or Windows XP Russian keyboard layout. We have the Russian Windows XP/Student labels that allows you to create a Windows XP Russian keyboard layout or the Russian Student keyboard layout. Russian (Student/Standard) labels are a very economical option for creating a bilingual Russian (Student/Standard)keyboard. The language labels use an easy peel-and-stick method to install. They will not damage the original keyboard key. The letters are printed on the underside of the Russian (Student/Standard) labels sothat the lettering will not wear out. This affords you with many years ofdurable use. Tavultesoft Keyman. The Keyman application is similar to Parawin in that it allows the user to create new keyboard layouts and edit keyboard layouts in Windows. The product is free for personal use or personal educational use. The product does not include keyboard layouts or fonts necessary to type in a language. 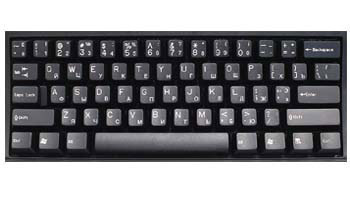 There are numerous keyboard layouts for many languages that you can download from various web sites at http://www.tavultesoft.com/keyman/downloads/keyboards/search.php. You must also download the appropriate fonts needed for the language you wish to use. This product does not support right-to-left text entry as required in Arabic, Hebrew and other complex scripting languages.